Together with the Economic Agreement, the charters or statutes – or, in Spanish, fueros – are at the core of the legal system governing the lives of the Basque people. They embody their unique identity, encoding centuries-old customs and traditions. In the beginning, the charters were a set of public and private laws regulating the administration of the Historical Territories of the Basque Country. Their main characteristic was that they were flexible enough to apply to a wide array of situations, being as they were in constant evolution. Charters were drafted at local assemblies, whose representatives met at the General Assembly – the highest governing body in each Historical Territory. In Bizkaia, the General Assembly was held at the Assembly House in Gernika, under the world famousancient oak tree known as ‘the Tree of Gernika’ – a symbol of Bizkaia and the Basque people. Dating back to even before the Middle Ages, the Basque charters laid the foundations of one of the first democratic systems in Europe, a system in which citizens were involved in public life. There was nothing like them in those days. Bizkaia – mentioned in the Chronicle of Alfonso III, from the tenth century –, Gipuzkoa and Araba kept their traditional institutions after being annexed to the Kingdom of Castile in 1200. Actually, the kings of Castile had to pledge allegiance to the charters of Bizkaia under the Tree of Gernika. 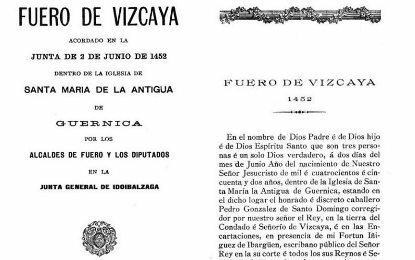 Regulations by the Lord of Bizkaia or the King of Castile that violated the charters led the General Assembly to apply the so-calledPase Foral, which meant the regulation was ‘obeyed but not enforced.’ It was thus established in the Old Statutes of Bizkaia(1452) and in the New Statutes (1526) too. The Old Law of Bizkaia (1452), published by the Provincial Council of Bizkaia in english. In their oaths of office, every lord and king recognised the privileges of the Historical Territories of the Basque Country as granted in the charters: their status as free trade zones and the concomitant tax exemptions, release from military service except to defend their territories, and autonomous internal administration. In the nineteenth century, the charters lost their strength. With a few eliminated articles and failed attempts to restore them, the Basque Country lost some of the peculiarities of its political and legal system. The trend worsened with the Carlist Wars. By virtue of a law passed on 21 July 1876, the charters were derogated. Some of the articles were revamped into a series of administrative and tax ‘contracts’ with the newly-established liberal State. These contracts made the core of the Economic Agreement. It was only on 1 October 1936 that the Republic Parliament passed the Statutes of Self-Government that make it possible to establish the first Basque Government, whose jurisdiction was confined to the area not occupied by the Francoist troops. In its derogation clause, the Spanish Constitution of 1978 states, ‘The Law of 25 October of 1839 is hereby repealed as far as it affects the provinces of Araba, Gipuzkoa and Bizkaia. Under the same terms, the Law of 21 July of 1876 is repealed as well.’ This brought the charters back to life. In 1979, a referendum led to the approval of the Basque Statutes of Self-Government (Gernika Statutes), a fundamental law concerning the exclusive competences of the Basque Country.